Here will reside all known documents on the language, spanning various periods of development from Old Éa to modern mërèchi. Excerpts from a conhistorical account of Merechianist linguistics can be viewed here. Ea was the language- and world-building project embarked upon in 1984, when I read Tolkien's Book of Lost Tales (I) at age 12 or 13, influenced originally by German, Latin and proto-Elvish, later picking up various and sundry influences, growing quickly in 1987-1988, all but forgotten in the 1990s, and growing by sporadic jumps in the 2000s. The language began as a shameless relex of English, except for having (mostly) postpositions instead of prepositions, and having verbs conjugate fully (in classical mërèchi onward) by having the subject pronoun appended to the verb; it has been becoming more agglutinative since then, especially in the area of derivational affixes on verbs. It has recently given birth to a daughter language, Mirexu, with a much more polysynthetic outlook and influences from Dravidian and Caucasian languages. 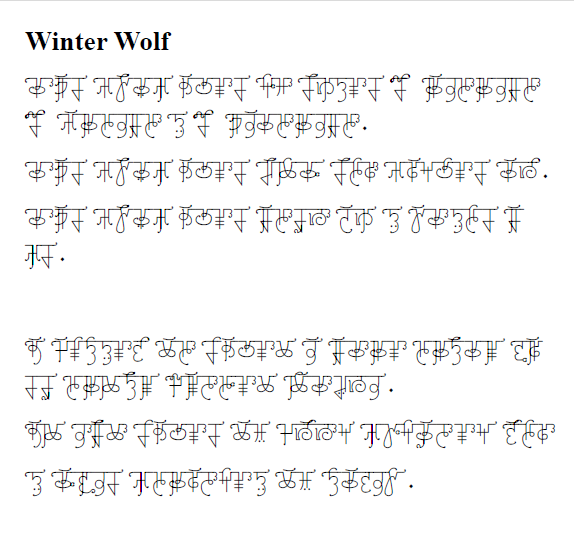 A sample of the native orthography, a Hindic-esque alphasyllabary, can be seen here, or in a PDF document here. The romanization is quirky, and uses diacritics in unconventional ways; an explanation is available here. A descendant of mërèchi, Mirexu has been used in Conlang Relays 15 and 16; web documentation is forthcoming. The four mërèchi texts used in the 9th Conlang Relay: the starting text and the translations back into mërèchi at the ends of Ring 1, Ring 2, and Ring 3. See the calendars of the mërèchi year! "mërèchi tërín alitànö" is a 146-day calendar which can be seen in its entirety by clicking on "Go to year view". The "zyentinaz" calendar was inspired by the Mayan calendars which ran in simultaneous cycles of differing lengths; think of it as a slot machine with three rollers, one having 3 values, the next 11 values, and the third 17 values, for a complete cycle of 561 days. If you hit the jackpot, it's a major holiday. View the intricate kinship system, from a male or female point of view.